Whatever else one takes away from Nebraska Rising, a current exhibition of 11 area artists at the Bemis Center for Contemporary Arts, two things are remarkably clear. One, the region is not lacking in a diverse group of artists who, at whatever stage of their career, fly under the radar or out of the limelight. Those artists include: Heron Basset, Mary Elizabeth/Mesonjixx, Phil Hawkins, Roberta Leaverton, Joey Lynch, Liana Owad, Kristae Peterson, Christopher Prinz, Craig Roper, Barbara Simcoe and Michael Villarreal. And two, it’s encouraging for both local artists and viewers to see Bemis Center commit to the above going forward as confirmed by Exhibition Manager Alex Priest, a member of Nebraska Rising’s curatorial team. The application deadline for this new position is Aug. 29, and the new curator will hit the ground running Jan. 1, 2017, responsible in the coming year for three exhibitions and programs that include both local and national artists. Meanwhile, along with Bemis’ impressive second edition of its Time & Space exhibit subtitled Futures, also on view in Project Space I, 3 and video room, it’s more than “Nebraska Nice” to see significant contemporary art of any kind installed in this venue, especially when the majority of the 2D and 3D works in Rising stand on their own creatively and professionally regardless of or in support of any concept or point of view. A simple but thoughtful walk-through of the Bemis’ space, on the first floor at least, will verify one’s appreciation of original art properly organized and installed. Perhaps someday that sort of experience will be extended to its former Underground which, in the past, further extended the center’s mission of incubation and experimentation, especially with local and regional artists. Curator Priest interprets the exhibit’s title as “two intersecting concepts” that compare the state’s nuanced terrain to the subtleties within the careers and styles of the chosen 11, each elevated to a higher plateau in this exhibition. Nebraska Rising germinated as a sort of perk, a juried exhibition that rewards 11 artists who participated in last year’s Bemis Benefit and Art Auction. Artists that lived within 100 miles of the city were chosen form a pool by Nicole Caruth, a former Bemis artistic director, Ellina Kevorkian, artistic director, residency programs and Priest, who conducted studio visits with the eleven to collaborate on work chosen. As such one can argue that Bemis is doing “the right thing” rewarding artists helping artists, a claim rightfully made by a former director Mark Masuoka on behalf of the annual auction fundraiser that benefits the venue’s vaunted residency program. One can also point out that this exhibit then primes the pump for the next auction this October by keeping such in the minds of its various publics as well as participating artists who will carry the weight. Whether another Nebraska Rising or its ilk comes with the package remains to be seen. But it’s a nice carrot, as it were. And for the most part, this is a worthy exhibition that meets most of its goals as discussed. Can one also infer from its title that it not only raises the bar for a few under-appreciated, overlooked or seldom seen artists, it gives the local art scene a bit of a bump by suggesting that this group has something new and interesting to offer? If so, then who in this group can we really anticipate to rival the household names in this area who get most of the attention at galleries and art centers of all sorts and often on too regular a basis? And finally, who are the movers and shakers in this exhibit, the rising stars in the firmament or, in this case, on the landscape? If “landscape” is its unifying motif, then Nebraska Rising must admit to casting a wide net in media, style and tone. Photography, sculpture (much of it the real highlight of this exhibit), painting, mixed media, video, assemblage and performance, all compete for attention, in this well-organized installation. Much in this exhibit lives up to its coda, its assertion that its landscape is not only “naturalistic but also physical, domestic or self-created.” Then there is the landscape of the exhibit itself. Some “connections and aesthetic tendencies” work better than others, and a few artists are more successful individually than by comparison or juxtaposition. Two such examples are the works of multi-media artist Barb Simcoe and painter Kristae Peterson. In spite of occupying a center-stage sightline on the far north wall of Project Space 2, Peterson’s abstract triptych, “My Nebraska Spirit I, II, III,” recedes even further, out-maneuvered by the vibrant Simcoe photography stage-right and especially the dynamic wall sculpture of Hawkins rounding the corner stage-left. Peterson makes a brave attempt with these large works in a newer vein, but her repetitive, painterly noodling or riffing pales in comparison to the above juxtapositions as well as with her more familiar colorful palette … and thus get lost in this landscape. As for Simcoe’s photo installation, the issue is one of numbers. Her signature photomontages have served her well for over a decade, and it’s a pleasure to see them again, but nine singular examples constitute a virtual solo exhibit, less so a participation in a group show. A triptych of her own would have sufficed to re-introduce or initiate the viewer to her layered vision of classical and religious myth, memory and contemporary culture from a deeply personal and feminist point of view. Nine standalone works simply overwhelm, but take a good look at Simcoe’s “The Truth Too Old to Tell” and “Pantheon” in order to appreciate not only their ethereal beauty but their tone of longing, meditation and symbolic portent. A more successful photographic install looms across the gallery with the dioramic collage of Roberta Leaverton titled “Operation Iraqi Freedom,” whose impact is larger than the sum of its parts. This quite personal, evocative narrative of her deployment in the above was assembled from her journal and a collection of archival material. Though in miniature, these wartime scenarios are not amateurish compositions or stagings, the production values are solid and professional, cleverly placing the viewer in each frame at eye or action-level. The apparent patriotic point-of-view and tone is more complex, however, than one might first imagine. The viewer can’t help but be conflicted as these scenes, while conjuring up patriotism, honor and duty, rightly so, may remind some of days playing with toy soldiers in a sort of puppet animation when war and ground combat was only a virtual reality, an innocent game then, perhaps a political game now. The diorama also more than suggests a larger role for women in the military as well as in global leadership in all fields. Though their crosscutting “dialogue” is shot with him in color and her in black and white, his rants, ramblings and ravings are diminished in sharp relief to the nuanced shades of gray that punctuate the quiet resolution of her awakening to a brand new day and beginning. As with Leaverton’s work, the images linger longer. So do the screen prints of Joey Lynch as Bemis welcomes back one of the more provocative artists in this area in this medium. Lynch’s multi-layered prints, paintings and posters have always had a counter-culture appeal to them, embedded as they are with pop, mythical and political figures, often appropriated from the media. Then, as with these works in this exhibition, especially “Another Haymarket” and “Assumed Chaos,” he will measure many of them with iconic objects of mass production, destruction and consumption in categories that include modes of communication, entertainment, weaponry and transportation and, at times, text. Nothing seems to be beyond Lynch’s expressive reach and grasp. As successful as the 2D work in Nebraska Rising is, the exhibit truly comes into its own with the 3D entries … all of them. Whether on the wall, floor or ceiling, they dominate the space they occupy and, in a few cases, redefine it. The most unassuming pieces belong to Craig Roper who is, like Simcoe, a mid-career artist who hasn’t lost his touch or perspective. Particularly his “bundles,” a set of mixed media composed of found materials based on his travels in this region. But the most imposing sculptural work here is owned by the remaining five artists who are early in their careers or just emerging. Center stage in the gallery is given to Liane Owad and Heron Bassett, who contrast nicely with their aesthetic. Owad’s “Un (familiar)” is an all-beige whirligig composed of foam cast from repurposed domestic forms, in this case vintage light fixtures, of all things. Which would explain then why they resemble a revolving, part-ceiling-fan-part-chandelier when activated by a viewer. The aptly named kinetic sculpture is therefore Nebraska (re)sourceful. While Owad’s piece expands its space, Bassett’s “Center” anchors it appropriately between its four pillars. His solid take on a Rubik’s Cube, already solved, is exactly the sum of its individual parts and layers made of wood, brick, concrete and more. While she is all about appropriation and innovation, he is about materialism in the from of structure and architecture. Another interesting contrast in form and materials is offered on the south wall that extends the exhibit into the main hallway. Michael Villarreal’s monochromatic white wall sculptures, resembling window frames, virtually blend or melt into the equally white brick background. Described as “faded memories and object associations,” these are windows into his soul, especially the portentous “When I Was in Vietnam.” Not only are the blinds shut, they are imploding deep within the unconscious. This is some sublime, scary stuff that nightmares are made of. Hovering above Villarreal are the nickel and brass fragments of Prinz’s imagination objectively titled “Ceiling” and “Wall,” as if thrown there by this accomplished industrial designer just to see if they would stick. 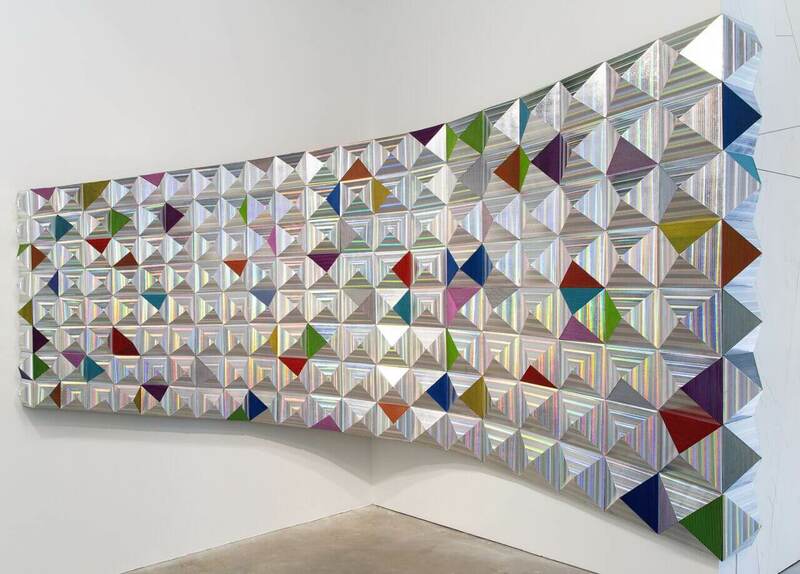 These jagged, metallic throwaways are among the most accomplished pieces in this exhibit, scrap metal art that suggest those fleeting moments of inspiration, here one moment and gone the next. One caveat: Prinz’s “Ceiling” would benefit from a better spotlight on it and a bit of distance from the surface … as with “Wall” … which would create a similar complementary depth and shadow. Perhaps nothing here surpasses the corner installation of Hawkins for original design and visual impact. His 3D geometric construct of undulating building blocks and pyramids made of painted cardboard doesn’t merely occupy space, it transforms it. What’s more, the icy silver grid, whose surface both reflects and creates light into a prismatic palette, transforms the viewing experience as well. Since the installation is curved, the optical illusion of depth perception increases as one gets closer. As you approach the corner at ground zero, you virtually enter a third dimension, so encompassing is this sensual encounter. Hawkins calls his cosmic environment “Flux,” a fitting metaphor for the entire exhibit, perhaps. It is said that the only constant is change. Nebraska Rising suggests, contrary to another adage, that the area’s creative landscape will not stay the same. Nebraska Rising continues through Sept. 17 at the Bemis Center for Contemporary Arts, 724 S. 12th St. Visit bemiscenter.org for additional information.